The market values of the 2wheelers business have been increased to approximately 8 trillion dollars as per the statistics made at 2017, on comparing with theearlier survey it says among tremendously increased 200 percent in a cycle. As per the stat, per day 3 million to 4 million peoples searching 2wheelers products and brands according to their essentials. Since our website has many groupings such as bike, motorcycles, 2wheeler parts and related accessories etc. Our Automobile Vehicles Ad Listings Script has multipurpose utilities and multi-vendor functionalities support with vendor credentials. Once user login with vendor profile they can post any kind of classified listings of motor vehicles. We have designed our 2wheeler Price Listing Script with millions of user data and to support 1000 of vendor details support and more at easier way. As discussed earlier, classified listing not only used to list 2wheelers either car, second-hand goods, various automobile products with fantastic search functionalities. The user can search goods by manufacture category, price filtering methods, fuel type, bike models and even mileage calculation so and so. Revenue models provide you variety of income to your business idea which includes banner advertisements, Google AdSense, andcommission based setup etc. 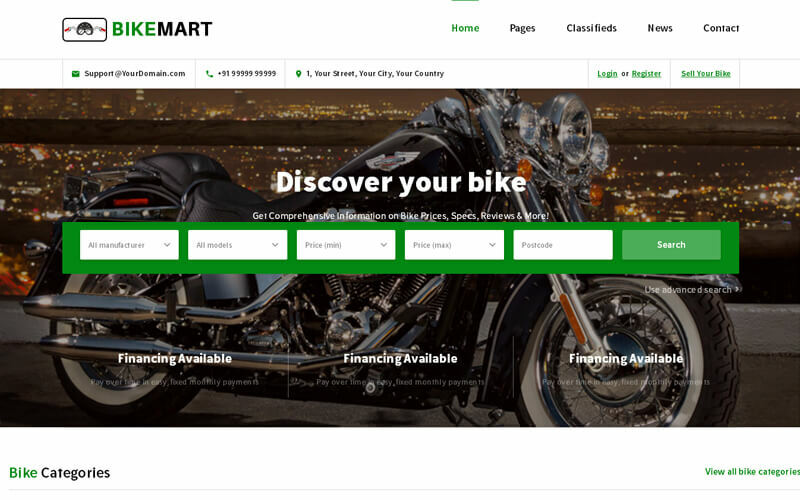 Auto Classified Open Source has detailed page to describe the business concept through our customizable CMS page, also it comes with product comparison feature to filter the preferred bike list from the clutches of theresult. Additionally, theFinancial calculator was introduced to the end user can analyze the payable amount monthly or weekly accordingly. Such a responsive design, we have used the latest technology of bootstrap responsive design to provide the user-friendly experience to the script to reduce the anonymous tedious to work reliably. Since responsive made with high loading speed which enables thesite to work under slow internet connections, a dedicated multi-language support to use the script without any difficulties. By default, our Car Dealer Classified Directory Script has SEO friendly and responsive structure, dedicated designed to work free flow of SEO-friendly concept with Google principles so that you need to worry about SEO concepts. Support responsive is quite appreciable, if you found any difficulty in handling script support team will get back to you immediately.